Pop, pop, pop — how can you improve on the fun of popping a balloon? Having a prize given to you for doing it, of course! This idea is a simple fundraiser and can easily be incorporated into other events you're hosting, such as a fundraising dinner or fair. You'll need to get your hands on balloons, string, slips of paper (with prizes printed on them) and a helium tank. Tour around local retailers, explaining who your group is and why you're raising money — see if they'd like to donate prizes in exchange for some free advertising at the event. On the actual day itself, put the prize slips inside your balloons and then fill them with helium. Attach the pieces of string. Every balloon should have a slip inside so that they all look similar, even if it says nothing more than thanks for participating. You might want to keep all the balloons the same size and color for consistency. 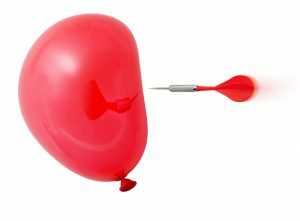 As you sell the balloons for a set price, tell people to hold on to them until they've all been sold. At that point instruct everyone to pop their own balloon and see what they've won — it should be fun watching the different methods people use to do this. The winners can then be awarded with their prizes. This is a great way to raise money. Last year for our United Way campaign this is one of the events that we offered to our employees. We sold out! We had enough donations so that all of our balloons had a prize in them. We charged $1 per balloon and prizes were at least $1 in value or more. We had donations made for chips, soda and candy bars and we put in a few $5 gift certificates to DD, and a few $15 gift certificates to local restaurants. Almost everyone participated at least 1 time if not more. I think knowing that they were going to at least get their money back was the big seller for us on this one! Could you tell me about how much money you made? About how many people were there?